When it comes to ones home or office someone who may not normally be picky might change their attitude, which is completely understandable. For many these are the places that one may spend most of their time, so why not create an atmosphere that you want to be in. A home should be a place where one can feel comfortable and safe, as well as feel proud of. A home is also a space where one can let their creative side come out. You can tell a lot about a person when you look at their home. How they decorate it, what it smells like, and the type of atmosphere they have created. There are 7.6 billion people in the world and each person has a different style, or a different taste. One persons boho chic room may not appeal to another, or a modern sculpture may be a work of art to one and make another roll their eyes in the back of their head. It is our goal at Oriental Furniture to have products that appeal to many different tastes. There is one style that will never go out of trend and will always be high in demand, and that is simplistic, or minimalistic. A simplistic piece can easily fit into a minimalistic or a shabby chic home. Many people are in favor of living a minimalistic lifestyle, and it actually makes a lot of sense. There are many ways that having a minimalist home decreases stress levels. If you think about it, how often do you find yourself frazzled by the amount of “stuff” you have laying around the house. It is quite easy to make a home feel cluttered with too much furniture and decorative items. Not to mention the more furniture means more places for dust to settle which naturally leads to more cleaning. No one wants to come home after a long day of work to a disarray of chores and clutter. Honestly, that is enough to make me want to simplify my home ASAP. If you are looking to add some pieces to your home that will help to create a minimalistic environment or just simply like simple things look no further. Our simplistic Shoji screens are highly practical and exceptionally easy to style. They will fit in with other designs and will not leave you scratching your head trying to figure out where it belongs. Browse our easy to style screens here. Bamboo is a flowering evergreen perennial from the grass family known as Poaceae. Along with other grasses fro the Poaceae family Bamboo tends to be hollow on the inside and has a wood like texture. Bamboo is one of the fastest growing plants in the world. Some species of Bamboo can grow up to 36 inches in 24 hours, that is 1 inch every 40 minutes. Having a higher compressive strength than wood, brick or concrete Bamboo also has a tensile strength that rivals steel. Because of this Bamboo has economical significance. Through out Asia Bamboo is used for building materials, as a food source, and a versatile raw product. Bamboo is also great for filtering gout airborne toxins such as carbon dioxide, formaldehyde and Benzene. It is amazing how versatile Bamboo is and it is a relatively easy crop to grow. In Chinese tradition Bamboo the significance of lucky Bamboo depends on how many stalks you have. I am talking about the variety of Bamboo that you out inside your home, not the kind that you see along side the road that grows in voluptuous crops. There are different meanings associated with the arrangements of Bamboo. Two stalks represent love, three represent Fu (happiness), Lu (wealth), and Soh (long life), four stalks represents the parts of life that impact wealth. The arrangements go up to ten stalks and ends with twenty one which represents a powerful blessing. Bamboo is highly momentous and is consistently sought after. There is high demand for house plants nowadays and Bamboo is a plant that you will find in most peoples homes. Bamboo is also used for many decorative designs, as well as furniture. It is important to know have the knowledge about something that we as people use so frequently and in many ways. In a way by educating ones self in even the smallest things such as what kind of house plant one has in their home, or the Bamboo chair they own, we are showing respect for the materials we are lucky to have. It also creates more of a personal significance, and I can certainly tell you that after learning more about Bamboo I would love to have more pieces in my home crafted from it. The Bamboo pieces that we sell at Room Dividers are special to us because we feel that they represent a culture and a style that we hold high respect for. We are simply captivated by the hues of Bamboo, it is not easy to miss the various shades of green and tan. We offer alluring pieces made from Bamboo that will compliment any and all spaces, adding a simple touch of nature to your space. Take a peek at what we have to offer! In the last few weeks the great outdoors has gone through many changes. The snow has melted away, and there has been ample amounts of rain, which has powered the growth of new spring foliage. There is a color that has become more prominent and will be staying with us for the upcoming months, that color is Green. If you were to look outside right now what would you see? Probably many trees with bright green leaves that have just begun to unfold, and lush grass that is finally pigmented with chlorophyll. We can all come out of our shells to let the sun willfully rid us of the inevitable winter gloom that has hung over our heads these past months. It is easy for one to feel a wave of new life developing within, almost as if we have a new start. There is a sense of rejuvenation and excitement as we begin to truly feel the warm weather approaching. The color green has various key traits that make it an optimal color. Green falls directly in the middle of the color spectrum making it the easiest color for the human eye to see. Our bodies go through less strain when trying to perceive the color green which results in a relaxed nervous system. 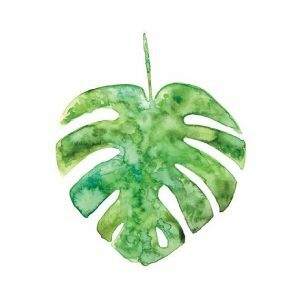 Being such a calming color green is ideal for color therapy, and is usually found in schools and hospitals. It is instinctual for humans to know that when vegetation is green it is most likely safe for consumption. This is why green symbolizes freshness, and good health. Green also embodies the natural world which represents growth, fertility, energy, tranquility, and luck. Green is an exceptionally powerful color and if being around the color does so much for us then we should certainly have more of it close by. Luckily at Room Dividers we are highly enthusiastic about having a large assortment of products in all the colors in the spectrum. When it comes to Room Dividers people can be very picky, and we don’t blame them. A room divider can be anywhere from two feet tall with 3 panels to six feet tall with 6 panels. When one picks out a room divider it is an important decision to make. A room divider can easily change the atmosphere of a space by adding flare or my simply creating a peaceful environment. There are far more options than one may thing when it comes to room dividers, at least at our store. We offer simple Shoji screens which can match perfectly with any style, but there are also dividers that are exclusively for particular tastes. On our website we have Art Print Room Dividers and there are over 200 unique prints that we have to offer. The prints are bold and saturated with color giving the photo the justice it deserves. Plus they are double sided so they are perfect for partitioning a space. If you have a dream of living in Paris we have a gorgeous print of the Eiffel Tower. If you are an avid animal lover we have dividers with paintings of African Savanah Wildlife as well as photographs of packs of Wild horses as they storm through the desert. Maybe you prefer paintings by the classics like Edgar Degas. Last but not least we have dividers with exquisite oriental prints. That is why we love out Art Print Room Dividers, and we hope you love them too! There is no denying that creating art is marvelous for one’s brain. For some it is a mediation and for others it is a form of therapy, there is a long list of benefits one gains from art. Art has been used to help relieve stress as well as to boost ones self esteem. Overall ones quality of life is drastically improved when one is creative. If making art is so powerful for the creator isn’t it valuable to the viewer as well? Van Gogh once said “Paintings have a life of their own that derives from the painters soul.” There is deep sentiment within a painting for an artist and in turn the art also provokes emotion and thought inside a viewer. Your brain goes through diverse changes when you look at a work of art. By looking at art your brain becomes stimulated as it tries to organize patterns and making sense of shapes. There is also increased blood flow to the brain by as much as 10%. That is the equivalent of looking at someone you love. Hopefully most of you can imagine exactly how you would feel looking at someone you love. Maybe a little warm, excited, and certainly happy. If looking at art is so good for you then what is holding you back from surrounding yourself with beautiful pieces of art. One of my favorite painters is Monet and when I look at his paintings I feel a sense of ease. Naturally I put one of our room dividers with a Monet print on it to good use in my. What is art to you? What moves you? At Room Dividers have an abundance of screens with prints of famous artists to pictures of trickling streams, there are plenty of options to choose from. Today a majority of furniture and household items are made out of materials other than wood. Plastic is one of the most common elements used now days due to it’s convenience. Plastic lasts a long time and it usually calls for less repairs, unlike wood, plus it is commonly cheaper. However, despite the effort companies have made to replace wood, it is a project that will never fully be done. There is much more beauty and sentimental value when it comes to wood. A majority of items like furniture, tools, and modes of transportation were originally crafted from wood partially because one had minimal options for materials but wood was and still is extremely useful. There are copious varieties of wood that offer different benefits from color, to strength, and even to durability. For example, the hardest wood in the world comes from what is called an Ironwood tree, which goes by the name of Australian Buloke which comes from Eastern and Southern Australia. The second strongest wood actually comes from a flowering plant in the cashew family, it goes by the name of Schinopsis Brasiliensis, it is native to Brazil. Wood has other unique values that you simply cannot replicate with other materials, such as the particular patterns. The pattern one sees in wood comes from what is known as wood grain which is the longitudinal layout of wood fibers. The complex markings are completely natural and are unique to each piece of wood. Wood can be bent into a curve, or cut and chiseled into a pattern. As hard as wood is it is a clay to craftsman that can be molded into what ever they desire. Wood goes with an array of tastes and can easily fit in with any style. Switch out your plastic chairs for some wooden ones and notice how the space changes. Replace the shelf you bought from Ikea with a alluring shelf made from Mahogany. Each piece you purchase will hold some sort of history within in. From it’s past owner/s to the person who created that unique piece. These are characteristics that you find in wood will not appear in pieces made my plastic or industrial materials. At Room dividers we have an assortment of room dividers that are beautifully made and are a quick fix if you are craving that au naturel look. 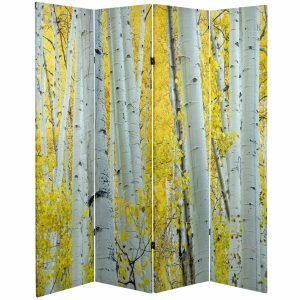 If you love trees but aren’t into having a wooden room divider we have plenty of dividers with tree prints that will do the trick. 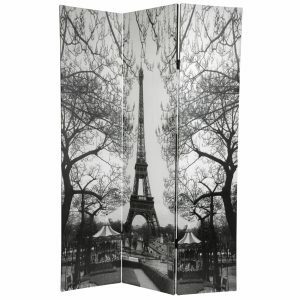 Nowadays the portable Room Dividers you see in a majority of stores may seem like they are a relatively new design. However, these pieces came from China around the 4th century BC. From the beginning, the screens have been used for practical and decorative purposes. In addition to being a practical tool for partitioning a space they were works of art. Since they were created approximately 2300-2400 Years ago the screens have come a long way. By the 2nd century BC, the Japanese had adopted their own versions of the original designs from China. These became known as the Japanese folding screen, which had multiple variations. The first was the Byobu screens which were lavishly adorned. They were made from multiple joined panels allowing one to fold the screen. The folding capability of the Japanese screens made for them to be more agile. After the Byobu screen came the Shoji screen. The Shoji screen incorporated a layered rice paper that was lightweight which made the screens easier to move. 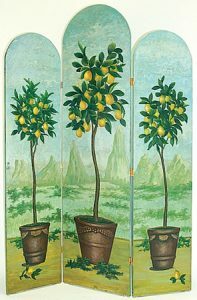 Between the 15th – 17th century Europeans and later Americans who had traveled to the Pacific rim began returning home with the screens where they soon began to sell room dividers to the public. The arrival of the screens in the new market led the local craftsman to begin creating their own versions of the screens. American and European craftsman began incorporating materials such as silk, leather, wood, mirrors, tapestry and embroidery. The usage of these materials resulted in the screens being adequate for preventing drafts in sizable spaces. The screens also became a luxury good and signified class status amongst the western nobility. Today, room dividers are not only used in homes. The screens have spread throughout society and are used in a wide variety of settings ranging from hospitals and clinics, to yoga studios, and airports. A single room divider can drastically alter and improve the atmosphere within a room. They offer privacy in places where it is needed, and a decorative element to a rooms layout. Room dividers are extremely versatile and are easy to install. 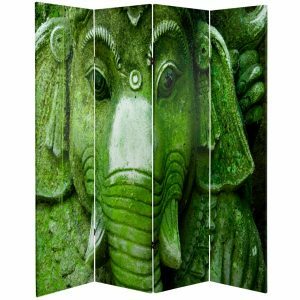 Our company is extending the tradition of asian style room dividers and adapting them to modern aesthetic. At Room Dividers, we are proud to offer screens that fit in any home and accommodate just about any budget. Although it is the beginning of Spring, there is still a wintery chill in the air. However, it is comforting to know that in a matter of weeks we will be shedding layers and sitting outside to soak up the warm Spring sun. If you look past the lingering cold grey weather you will see small blossoms that are starting to protrude out of the ground. The trees are expanding, pushing new leaves out from their branches. Spring is blossoming if you look for it. Instead of focusing on the last hints of winter, lets focus on the beauty that is yet to come. Cherry Blossoms are on the verge of bursting open and with that we will feel the full power of Spring. The blossoms will fill the air with a light, sweet scent and the landscape will be dusted with a pink hue. For me, Cherry Blossoms invoke a feeling of warm breezes that washes away all of the coldness that built up in our bodies and homes over the course of the winter. Not only are Cherry Blossoms easy on the eyes and nose, but they hold quite a lot of symbolism. Cherry Blossoms go back hundreds of years in the Japanese culture. They represent more than just a beautiful fragile flower. 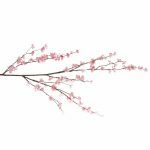 In Japanese culture Cherry Blossoms represent a form of beauty that is life itself. They see the fragility in the flower and it reminds them that life is precious, and short. The delicate blossoms inspire one to take a minute in the day to stop and look at what is growing around you and recognize the beauty those small buds hold. Before we know it, it will be summer, then fall, and soon after that the snow will cover the landscape. 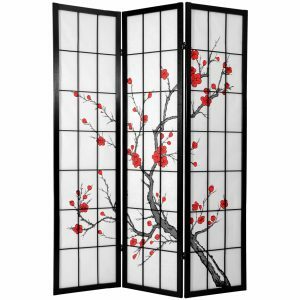 If Winter is especially hard for you, don’t fret, we offer beautiful Room Dividers covered in Cherry Blossoms that will make Spring last all year long right in your very own home. Room Divider Stands are designed to support a room divider or shoji screen while extended flat. The stands purpose is to turn a standard room divider into a flat partition or barrier. You can use this type of setup to create a temporary wall while maximizing the full width of the screen. The stand is crafted from solid wood with a u shaped channel and perpendicular feet supporting each end and they are offered in sizes to accommodate three, four, five, or six panel divider screens. Simply put a room divider screen inside the channel, drive the included bolts through the channel and the bottom of the panel screen frame, and your screen becomes a flat panel partition. These stands are well crafted and attractive, and offered in most of the same wood finishes of the most popular room dividers and shoji screens: black and white lacquer, as well as honey, rosewood, walnut, and natural pine. When used with a four foot or five foot tall shoji screen, or solid wood shutter style room divider, they work well between desks or tables in a restaurant. With three or four – six foot tall room dividers, in extra-long five or six panel wide designs, a business owner can create a long, temporary barrier through a large for a yoga or dance studio. Using the stands mean there is no width lost to bending the panels to support the screen. The price of the stands are similar to the price of the room dividers they were designed to support. But compared to similar size commercial grade, flat screen portable partitions used in churches, schools, and businesses, a divider screen with stand is quite a bargain. Every day there are people coming to the realization that they could benefit from owning a room divider. Whether they are moving into a dorm, opening a business or professional office, or maybe just to deal with sun on a computer monitor, the need is apparent. Choosing any new piece of furniture means balancing the practical purpose with personal taste, and finding the right room divider is no exception. The ideal room divider should serve its purpose effectively and look good doing it. As a decorative background, a modesty screen, a window shade, to partition a room or define a space, direct foot traffic, or hide a work area. Sometimes, over time, all of the above. The color and design of a panel screen room divider should compliment the décor of the room, and the following is a very general decorating suggestion, subject to many exceptions. The light weight, lighter colored, less expensive room divider designs are often most consistent with more casual, eclectic, urban interior decorating, though certainly, not always. Conversely, darker colors, and heavier, more substantial room divider designs, tend to compliment more formal, traditional American interior design, as well as professional office décor. This is a brief overview of the benefits and advantages of the most popular room dividers designs to help a prospective room divider purchaser choose the best screen for his or her purpose, and to get the most value for the lowest price possible. It’s a fact worth noting that most floor screen room dividers are imported from Asia. China, Malaysia, the Philippines, Indonesia, Thailand, as well as Korea & Japan, all have furniture making traditions that have included practical and beautiful room dividers designs for hundreds of years. How tall? (3, 4, 5, 6, or 7 feet) Do you have a low or high ceiling? How many panels wide? (3, 4, 5, or 6 panels) How wide is the space? Rice paper (allows light to pass through) or solid panels? (wood, woven fiber, faux leather, canvas, lacquer). Lightweight (shoji, plant fiber, canvas) or more substantial? (wood, faux leather, lacquer). Casual (shoji, plant fiber, canvas) or formal? (solid wood, faux leather, wall paper print). Mostly decorative (printed canvas, printed shoji, printed or dyed faux leather, Chinese lacquer) or mostly functional? (shoji, plain white canvas, woven plant fiber, or wood & fabric)? The process of answering these questions, of looking at room divider categories, looking at particular panel screen designs, and ultimately, comparing prices, will lead to “how much to spend?”, the final question when deciding on a new room divider. 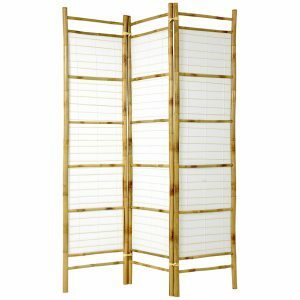 The most popular room dividers in the American furniture market are classic Japanese style room dividers or shoji screens. They’re light-weight, portable, sturdy, inexpensive, and most important: they let sunlight through the rice paper shade, reducing glare. For most people, they’re a simple and attractive home decor accent. 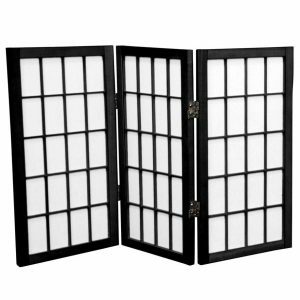 The wood frames for the least expensive shoji screens are painted basic black, to lower costs of production. In addition, they are also offererd with Pantone colors; red, pink, purple, blue, green, and gold, as well as popular ivory and white. 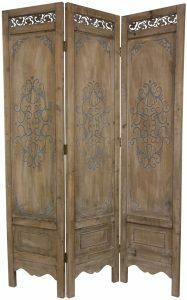 Higher quality shoji screen designs, built with classic Japanese style joinery, seal the wood frames with durable clear coat finishes over beautiful wood stains; cherry Rosewood, honey Oak, Walnut, or natural Pine. The authentic window pane wood lattice is the most popular, although distinctive, larger window pane designs are also available. “Cross hatch” or “double cross” lattice, and contemporary lattice work, like the “Eudes” or “Botanic” designs, also offer interesting, unique variations. For most shoji screen room dividers, the lattice work is on the front side only, with the back of each panel an open expanse of shoji paper. From a decorative stand point, only the front is viable. 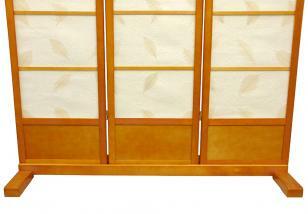 “Double sided” shoji screens are available, with lattice on both sides, at a premium over single sided shojis. 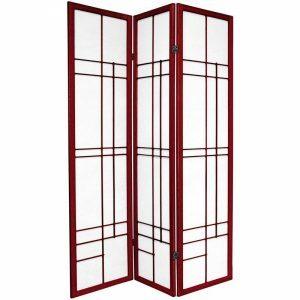 Extra sturdy shoji screen designs are available with a kick-plate at the bottom to reinforces the structure of each panel, and can help keep the rice paper shade from getting kicked or scuffed by foot traffic. 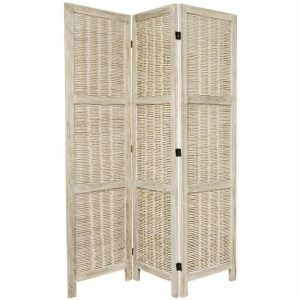 Rattan style room divider designs are popular, crafted from sturdy wood frames wrapped with abundant, sustainable plant fibers. Rush grass is popular, as well as plant fiber spun into a strong fiber cord, to produce beautiful, durable rattan style folding screens at surprisingly low prices. Part of the appeal of rattan style partitions and screens are the distinctive textures and designs woven into the panels. However, actual rattan was usually painted, and the paint flaked, making it a less convenient option. Happily, both rush grass and spun plant fiber cord absorbs colored dyes well, to create vibrant woven fiber room dividers, in white, beige, mocha, burgundy, cherry, mahogany, light green, and beautiful basic black. Plant fiber panel folding screens share the lightness and portability of Japanese wood & paper screens. The difference is that most woven plant fiber room dividers are mostly or completely opaque, effective to block light completely. Also, the fiber panels are durable and not easily damaged. Similar in appearance to tall window shutters, these are classic American design room dividers, crafted from solid wood, with a particularly solid and substantial look and feel. Crafted with fine wood finishes; honey oak, cherry rosewood, natural pine, & walnut brown, as well as classic white and black lacquer. Solid wood, stained with a fine wood finish, can convey a reliability and integrity in office décor, reassuring to clients of counseling professionals; attorneys, accountants, financial planners, family counselors, etc. 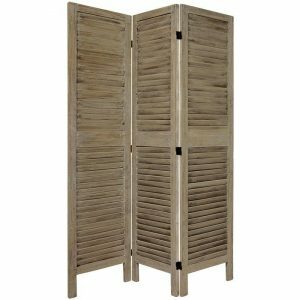 The most popular wooden shutter screens are designed with louvered wood slat blinds built into the panel shades. Adjustable like Venetian window blinds, they allow as much or as little light through the blinds as is comfortable for the user. Wide open, most of the daylight passes, closed tight, they become opaque. 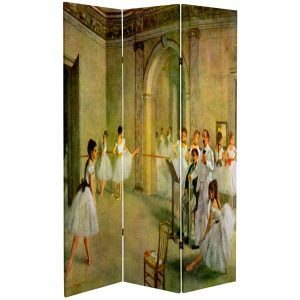 Folding screen room dividers crafted with sturdy wood frames wrapped with art quality canvas. 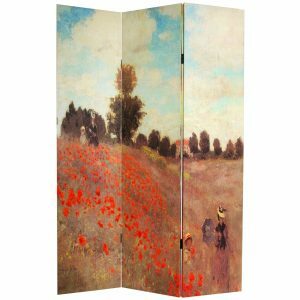 Lightweight and portable decorative screens, offered with hundreds of distinctive and unique art print and photo images, on both front and back, offered in 3, 4, & 6 panel designs. New ink jet print technology allows reproductions of classic European & Asian art prints and gallery quality photographs, digitally enhanced and printed on large swaths of primed artist’s canvas. The swaths are carefully wrapped around mitered wood frames, to create durable, portable art & photo print canvas room dividers. The selection of art print images is extraordinary. Chinese and Japanese brush art, Monet, Van Gogh, Klimt, Renoir, vintage Art Deco & Art Nouveau poster art, vintage commercial label art, travel posters, classic story book art. 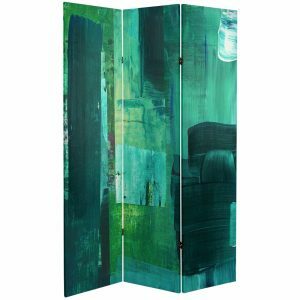 From Renaissance art like da Vinci & Donatello, to abstract and modern art, beautiful art print room dividers are classic and unique. Also, a large selection of gallery quality photographs have been digitally enhanced and cropped, and turned into beautiful printed canvas decorative floor screens. Photos of ancient sculpture, classical architecture, modern cityscapes and skylines and professional nature & landscape photography. Digitally reproduced images of classic European design wall paper patterns, including fleur-de-lis, toile, and damask designs are printed on three panel canvas room dividers to make portable, practical and elegant decorative screens. 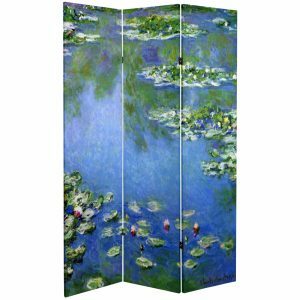 Also, several room divider retailers offer plain white primed art canvas room dividers, in 4, 6, & 7 foot tall variations, providing great DIY (Do It Yourself) creative and artistic “blank slates” for oil painting, acrylics, or decoupage. Usually offered in 3 or 4 panel sizes, faux leather and animal skin room dividers provide a sturdy, durable, and elegant alternative to solid wood shutter screen room dividers. The warm, beautifully textured look and feel of fine floor screens, upholstered with black, mocha, or burgundy dyed faux alligator, brown button tufted faux leather, and elegant Renaissance design printed patterns, compliment elegant, formal, and traditional interior design styles. Exotic zebra skin, wine red snake, and shiny silver faux crocodile room dividers provide unique, distinctive decorative accents for more casual, eclectic décor, in modern and urban interiors. These are slighter heavier, more robust and substantial panel screens, conveying a feeling of quality, with lacquered brass two way hinges accentuating the rich dark faux animal skin screens. Entirely opaque, providing complete privacy, and more than most floor screen designs, they tend to absorb sound. 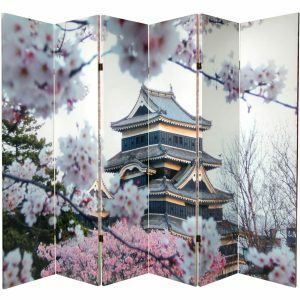 A limited number of specialty room divider websites offer unique shoji screen stands, sized to fit 3, 4, 5, or 6 panel Japanese style room dividers. The shoji screen is fitted into a channel running the length of the stand, to create a flat panel shoji screen partition; an effective temporary wall or divide. The stand’s perpendicular feet make the flat screen, whether 3, 4, 5, or 6 panels wide, quite stable. These stands work best for shoji designs 6 foot tall and under, as some 7 foot tall room dividers may be too heavy. 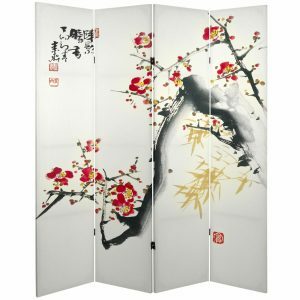 Although not as widely available as most folding multi-panel screen designs, single panel room dividers and partitions are available in both shoji screen styles and stitched matchstick designs, in an appealing variety of fine wood finishes. The important advantage of a single panel room divider is the greater stability provided by perpendicular feet. 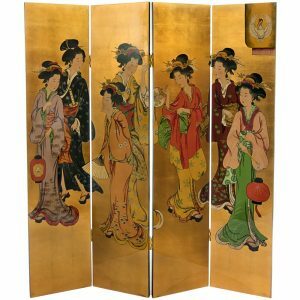 Choosing a single panel shoji screen is an excellent option for a semi-permanent floor screen barrier or divide, in a home or small business setting. The flat design takes less space, is less likely to be knocked over, and the shoji paper shade lets sunlight pass through. For applications where a single panel screen must block daylight, “Taka” style single panel room dividers are constructed with stitched flat stick shades instead of shoji paper. These are large designs, and also work well as long term partitions or “portable walls” for home or business uses. Most single panel room dividers are packed with the feet removed for safe shipping, and simple assembly is required. Some room divider retailers offer sturdy solid wood frame room dividers with white or off white fabric panel shades. These floor screens combine the sturdiness and strength of slightly heavier gauge wood frames, with the lighter panel shades that white cotton fabric provides. Note that some designs have the added advantage of removable, hence washable fabric panels, and some do not. The appealing look and feel of the classic combination of wood and white or off white cotton fabric has a dedicated following. 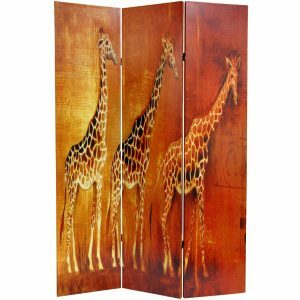 When searching the room divider market for interesting, attractive unique floor screen designs, this category shouldn’t be overlooked. The quality is excellent and the prices affordable, and most designs are offered in 3, 4, and 6 panel variations, in an attractive variety of attractive wood finishes. Ancient China has a tradition of beautiful, ornately decorated room dividers, including silk & mulberry paper floor screens, fine hand painted lacquered floor screens, & and classic carved coromandel screens, as early as the tenth century. Beautiful reproductions of classic Song dynasty style silk screens, with ink & water color art motifs rendered on Mulberry paper or on gold leaf applique, are lightweight and portable. However, the hand painted art is easily damaged; silk screens room dividers are practical for decorative purposes only. Extraordinary Ming dynasty design decorative floor screens are available in four and six panel configurations, coated with fine black lacquer, and elaborately decorated with hand carved mother of pearl. 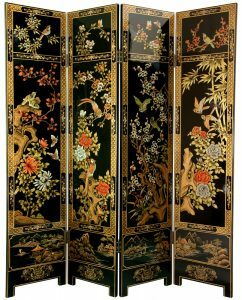 Also, exceptionally fine oriental style lacquered gold leaf screens, hand painted with Chinese court ladies or beautiful, Ming era birds & flowers art motifs, are available. Carved coromandel floor screens are still available in the U.S., offered by a limited number of importers, in three, four, and six panel designs. 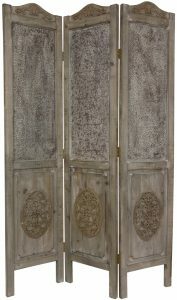 Wood panels covered with a thin coat of coromandEl clay, carved and painted with distinctive, unique oriental art motifs, including landscapes, birds & flowers, and antiqued archaic Chinese calligraphy characters. For enterprises such as churches, public and private primary and secondary schools, hotel conference rooms and large commercial office space, fabric padded steel frame room dividers, with our without casters, are available. Built for durability and stability as well as sound reduction, these are excellent enterprise grade portable partitions. They’re offered in a variety of colors, widths, and heights to satisfy the requirements of institutional and business customers. However, for the wide range of small businesses and professional practices that also require room dividers, partitions, and portable walls, we suggest the range of folding panel screen designs mentioned above. Japanese shoji screens, with their convenient portability and unique ability to allow daylight and provide privacy, are ideal for yoga, massage, and dance studios, as well as chiropractic, dental, and medical offices. For business with lots of foot traffic like restaurants, where the rice paper screens may be stained by food or damaged by foot traffic, rattan style woven fiber room dividers may provide the best looking and most robust choice for dividing and defining open spaces, creating a visual barrier at the entrance, or providing privacy for tables. For formal establishments, solid wood and faux leather screens also offer attractive options. For professional offices of attorney, counselors, accountants, financial planners or insurance; any practice where advice is rendered, solid wood screens, with rich, dark wood finishes, or, dark color faux leather or other dark color animal skin room dividers convey the sense of integrity and intelligence that the high quality products naturally suggest. 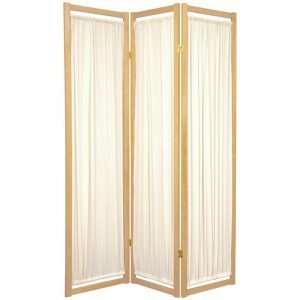 A limited number of room divider retailers offer a surprisingly wide selection of smaller sized folding screen room dividers, to serve a range of practical and decorative purposes. 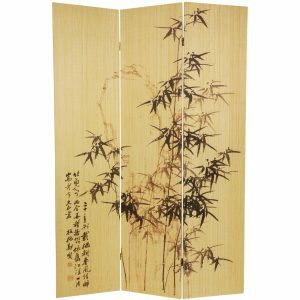 Two foot tall shoji screens, in a beautiful selection of fine wood finishes, and in 3, 4, 5, & 6 panel sizes, are popular for portable window shades, when daylight is inconvenient or privacy is required. At home and in shops, small folding screens are used for ear rings and jewelry, pinning pieces to the shoji paper for a unique and interesting display. Also, in both homes and businesses, 24” tall shoji screens are effective down the center of a table, so family or employees aren’t forced to work eye to eye facing each other. 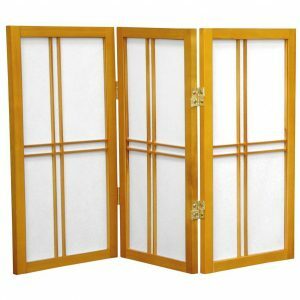 Three foot shoji screens are offered in both window pane and double cross designs, also useful for window shading, as well as hearth screens to hide a messy fireplace not in use, and as modesty screens in front of a desk or table for women in skirts. 48” tall (4 ft.) tall shoji screens, woven fiber screens, and wood shutter screen designs can be used for short cubicle style partitions, as well as to hide litter boxes or dog beds. 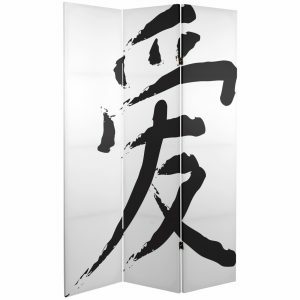 Five foot tall panel screens, including the Japanese shojis and solid wood shutter screens, can be particular useful for a divide that won’t interfere with eye contact and conversation in office settings, or for dressing screens in bedrooms or studios. Also, as a decorative room divider, five foot sizes are an advantage in rooms with unusually low ceilings. Cleverly designed and crafted three and four panel room dividers, with photo frames built into the panels, are used to display photos, art, documents, or maps. Most only have frames on the front, though some display pictures on both front and back. Picture frame room dividers usually accommodate 5” x 7” photos, though some are designed with a variety of picture frame sizes, including 8” x 10” and 10” x 12”. Loaded with family photos, they make great group gifts to parents and siblings. Some are used for enterprise purposes, to display images and documents relating to a business or an institution, or to market real estate. Photo screens can display heart-warming and funny images of couples at weddings, as well as to commemorate a loved one at a funeral or memorial. Also, for both business and home use, folding panel screen room dividers with cork bulletin board as well as chalkboard are available in 3 and 4 panel designs. Useful for simple communication in office and home settings, as well as for creative outlets for both children and adults. Easy to install with two hooks screwed into the ceilings, hanging a 4, 5, or 6 foot wide roll up window blind can function as an effective room divider. It’s important to find sizes that are at least six feet long, to provide privacy down to usually two feet from the floor, for an eight foot ceiling. Offered in beautiful colors of stained bamboo, wood matchstick, shoji paper, and a variety of colors of fabric, roll up window blinds can be a convenient privacy screen in an apartment or bedroom. These blinds are easy to operate, allowing the rolled blind to unroll to provide a barrier or partition. It is important to establish if the blind allows visibility, as some bamboo and matchstick designs aren’t stitched tight enough to provide complete privacy, if that’s the objective.